RV Propane safety should be understood by all RV'ers. In order to understand it better, here's a generic diagram of how it is connected and supplies your various appliances and safety devices. As you notice in the above diagram, lots of different devices use propane within your RV. Typically, the most important device, shown to your right, is not illustrated - the propane fume warning device. This "propane detector" is a 12 volt DC powered unit, usually low on the floor that is constantly on the alert for any propane fumes! If it ever goes off, open windows, shut off all propane and GET OUT of your RV!! If possible, shut off the main valve at your tank(s). Depending on the type of RV you have, the propane tanks will either be permanently installed (usually the self-contained RV's) or will have 1 or 2 portable tanks. Permanent tanks are more "convenient" in that you can go through long highway tunnels with them, don't have to be retested on a regular basis and are hidden from view. The portable tanks are easier to fill, however - you can leave your RV wherever it is parked, take the tanks to a refilling station and return to re-install them. Either type can only be filled to 80% capacity. Expansion room must be allowed. The portable tanks are governed by DOT standards, while the permanent tanks within motorhomes are within the ASME Certifications. 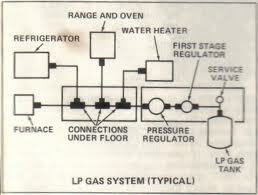 The RV Propane System within your RV will start with your propane tank. It will have a shut-off valve right on it - never block that! It should always be accessible. Next will be a pressure propane regulator to control the pressure of the propane coming out of your tank into your RV. A tank will have tremendous pressures on it - especially, when filled. The lines and appliances are built for lower pressures. From the tank and pressure regulator, the propane will go directly to your various appliances - water heater, furnace, refrigerator, stove and generator (if propane powered). Again, depending on the type of RV and it's options, you may not even have propane installed. Instead of a hot air blown furnace, upgrades for heating are a hot water type - like a radiator system in a house. This will usually only be on diesel powered vehicles and the system to heat the water is diesel powered as well. New and expensive RV's are coming with an "all electric package" that uses no propane and electric for everything. You better be prepared to stay hooked up a lot; have a really long extension cord; or listen to a noisy, stinky generator for hours on end!! If you plan on boondocking a lot - beware - your neighbors will hate you and the constant noise of your generators! Some gas powered vehicles are using propane generators to supply power. Hopefully, this gives you a better understanding about RV Propane and it's features - and limits!